In this guide, we will show you how much it costs to have a variety of tree types removed from your property. There’s no cut-and-dry way to determine the exact cost to remove a tree, so these are meant to serve as guidelines. For example, the complexity of the job and the height of the tree are just two pricing factors. Costs may also vary a lot depending on the condition and location of the tree. 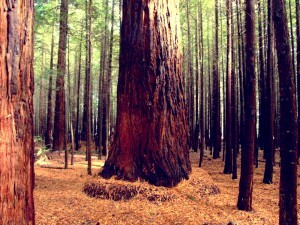 The average cost to remove a tree ranges from $150 to $1,500. But other tree services may cost extra. For example, the average stump removal cost ranges from $60 to $350 and the average stump grinding costs $75-$1,000 depending on numerous factors. There are many different levels of service available when removing a tree, but a few basic pieces are usually included. Obviously, the tree will be need to be chopped down. Typically, the contractor will also have to rope down pieces of the tree by climbing the tree and cutting it into more manageable sizes. In many cases, it may also be hauled away at no extra charge (or this is included in the estimate). For other considerations, see our complete guide on what to ask when hiring a tree removal service. Some people want more than a basic tree removal service. For example, if the price doesn’t include hauling away tree limbs, you may have to pay extra for limb removal. Tree limb removal costs vary, but it is usually between $50 and $75. Stump Removal – Stump removal is almost never included in the price of removing a tree. Unless you pay extra for this service, you will be typically be left with a stump. Sometimes, you can get a special price to have the stump removed as well. However, different equipment is required and is sometimes done by a sub-contractor which is why this extra service can be a significant add-on. The diameter of the stump helps determine the cost of removing it. You can expect to pay between $60 and $350 per stump. A rotting stump should be cheaper to remove than a healthy, solid stump. Learn more with our Tree Stump Removal Cost Guide. There is no realistic way for an average homeowner to safely remove a large tree from his or her property. You definitely don’t want to attempt this type of job yourself. One thing to be aware of right away is that it’s going to be expensive. The total cost of the job is calculated based on a number of different factors. 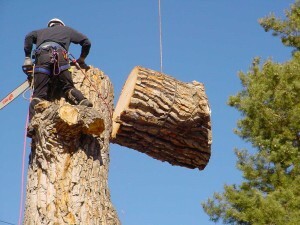 If the workers have to climb really high and rope down many pieces before actually felling the tree, which is usually the case with extremely tall trees, the total bill is going to be quite high. As noted above, you could pay $1,500 or more for that level of service. It may be worth it to try to have a few small extras thrown in for free, but not all companies are willing to do so. Oak is one of the strongest, toughest woods out there. For that reason, tree removal services often charge a premium to tackle them. Oak trees are also very tall. 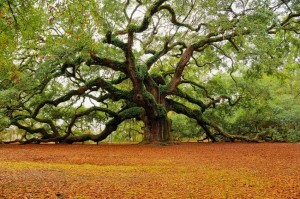 The average height of a healthy oak tree is 60 feet. You can refer to the price guide above to see that you will pay between $200 and $1,000 to have an oak tree removed. Due to the fact that oak is such a solid, thick wood, your total price will probably fall on the higher end of the scale. Make sure you have a really good reason to have it removed before spending that kind of money! There are many species of pine tree out there, but generally, the average height of a pine tree is between 40 and 60 feet. Some varieties soar up to 80 feet though. As you already know, the total amount that you’ll pay to have a tree removed depends on how large it is. 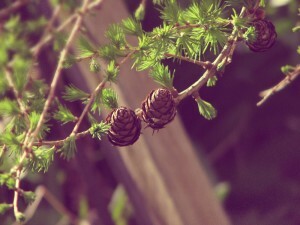 If you have a smaller pine tree, you might pay as little as $200 or so. If your pine tree is extremely tall though, you could pay $1,500 or more. This is another example of why it pays to collect quite a few tree removal quotes before hiring a contractor. What if you just need to have a few branches removed from a tree? If they are interfering with power lines, just pick up the phone and call your local utility company. They should come out and handle it at no cost. If you need a branch or branches to be removed for other reasons, you will have to hire a tree removal and cutting company. 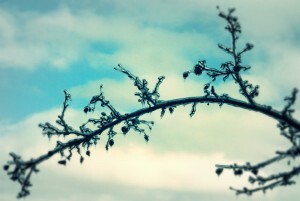 Obviously, if the branches are really small, you can probably do it yourself. In the event that you need to hire a professional, you can expect to be charged an hourly rate. Most companies charge between $200 and $300 per hour. If you have a lot of branches that need to be removed, it could end up being pretty expensive. Stump removal prices vary depending on many different things. The cost to remove a stump will vary depending on whether you do it yourself or hire a professional, but other factors come into play as well. By learning about the costs that are associated with removing a tree stump, you will be able to avoid unpleasant surprises. Learn more with our Tree Stump Removal Cost Guide. Size – The total height of the tree is one of the most critical cost factors. Condition – If the tree is healthy and strong, you may have to pay more. If it is dead, dying or rotting, the work will be easier and should result in a lower price. If you’re not offered a reasonable price, make sure to point out that the tree is relatively weak. 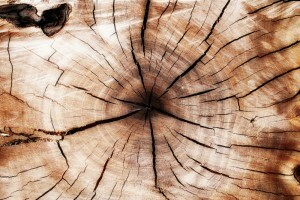 Diameter – The diameter of the tree’s trunk plays a role in how much you’ll pay. This also comes into play when grinding a stump. Theoretically, you could pay more for a shorter, thicker tree than you would for a taller, slimmer one. Location – It’s cheaper to have a tree removed if it is safely away from houses and other obstacles. 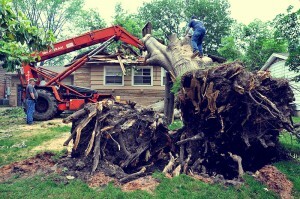 If there are many risks for damages to occur, the tree removal company is sure to charge more for the work. After all, their liability goes up and they will have to be a lot more careful, potentially utilizing more complicated techniques or more complex equipment. 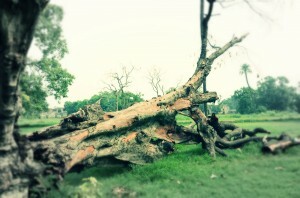 After a major storm or high winds, a tree may crash and cause damage to a house or other object. Tree removal services usually charge a lot more to remove these types of trees. The main reason for the higher price is because they have to be careful to not cause additional damage. Also, damaged trees pose more risks in general as workers are more likely to be injured. Although it may seem like a major expense to have a tree safely removed by the experts, it’s well worth it. By letting the professionals handle it for you, you will be able to avoid serious injuries and other problems. Besides, removing a tree isn’t easy. Why not let the pros handle it for you? To keep your yard looking as attractive as possible, you periodically need to have its trees trimmed into shape. 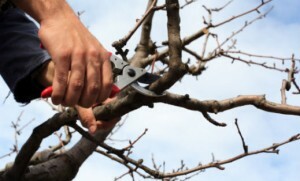 In addition to making a tree look more aesthetically pleasing, trimming or pruning can be used to remove dead or broken limbs that can pose serious hazards. The cost of tree trimming varies depending on a number of factors including whether you do it yourself or hire a professional contractor. Learn more with our Tree Trimming Cost Guide. Professional tree service should always be conducted by insured and qualified cutters. Tree removal services are listed to be one of the dangerous jobs to preform. Research the company you choose carefully. Atlanta Tree Company – local Georgia contracter. Free quotes! I agree with that statement. When a guy had 6 acres of land cleared of all the trees, I couldn’t help but think of all the birds having to relocate. Hi I’m a disabled vet and I dont have lots of money there are a few bade onses I need top and one dead one I need to bring down. even Habitat for Humanity in your area might be helpful for referrals. remove large cut on by utilities oak tree back yard of hom, remove stump, roots grass. removal of the good firplace wood as soon as poss ..ready to hire …need estimates. certified, registered, licensed. HI; I need some branches cut down from the side of my house that is causing some damage to my roof.. Could you help? I own a tree company & these price are false. If I charge 2k a day I can save no money with 4 employees 58k for fuel last year we pay $26 for every $100.00 payed out in workers comp. $2500 a day is a correct price for 5 guys trucks and equipment. Barbara $2100.00 is way off when you’re keeping the wood.As you see Brian’s post most tree service dont care they want to charge day rates no matter what. When most trees for a crew of 3 takes about 2-3 hrs depending on the job site lay out.If you haven’t had your tree tooken care of you can email me at xxxxxx@gmail.com I’m in tennessee. I’ll help you get your tree done for less or i’ll show up an drop it myself. I have a large tree in my back yard and I want it to be remove. I am wondering how much would the tree removal is going to cost me? I would have to disagree on the statement made on tree removal cost increasing on healthy strong trees. It is actually the exact opposite. A rotten, dead, or otherwise compromised tree is far more dangerous and unpredictable. Therefore the price of tree removal increases on compromised trees. With all the ice and trees down, I want to remind any readers not to run out there with your chainsaw and start chopping. Trees and even limbs are heavier than you think and can sometimes jump or twist unexpectedly when being cut. Also a chainsaw being used when on a ladder is a very dangerous thing to do for the inexperienced. and I will advise you on whether to call a professional or not. I agree with Lex above. Tree trimming is dangerous, especially in this type of weather. Different varieties of trees do require a different skill set. It truly is best go ahead and have a tree professional cut down your tree. People do get hurt, property gets ruined and there are some sad faces when an accident happens. Go ahead and get a couple of quotes. You can read more about tree tips and even identifying dead trees at http://www.atlantatreeprofessionals.com/tree-removal-service-atlanta/ or call and I can get you a free estimate 404-644-8733. The best defense is the best offense. I have a big tree in my home yard and creating problem. I want to remove this tree. Can you tell how much I would have to pay. A decent tree removal cost guide, give’s a good indication of what to expect. This is a great resource to provide ranges for tree services, but you’ll definitely need an estimate given in person. Layout of powerlines, property lines, municipal and residential property, these all must play into the price that a professional will provide you. That is also why you should always make sure you work with a licensed and insured tree company! Saving $600 on the job pales in comparison to the headaches and costs of injuries, property damage or issues related to your municipality. Get a quote from a local company, you won’t regret it! I have a really tall oak tree I believe to be. Is there any companies that pay to cut down your tree? Cause I’m sure the wood is worth a lot of money. If there is a professional forester in your area, they can come out and survey the oak tree to see if it’s worth anything. If so, they will take down the tree and pay you for the timber. There are also some lumber services who will pay for trees during peak harvesting seasons. It just varies depending on where you live, and if there’s a demand for oak. Hope that helps! NOT AT ALL ACCURATE RATES with not even a suggestion of basis in reality —These prices are way low across the board. Tree work is an extremely costly business to operate. Most are very small companies with huge overhead including very high insurance costs, expensive equipment, significant fuel costs, and equipment maintenance, just to name a few examples. Not to mention you’ve got a crew of 3-4 people on most any given job doing extremely skilled and dangerous work, almost all of then for less than $20/hour if not closer to $10-12. Our business positively could not survive charging such low rates, none of which are backed up by data of any sort. You’re not doing anybody any favors–not the customers & definitely not any truly professional tree care company–by cooking up a bunch of completely false pricing models and posting them on the internet. Please stop. Thank you. Do tree removal companies typically offer discounts if they are hired to take down a large number of trees? For instance, if the back of a one acre property is wooded and the owner would like to clear multiple 50-70ft trees. Will this be significantly cheaper per tree than taking down 1 or 2? I am house hunting in a wooded neighborhood and some owners have already cleared most trees from the property while others have not. I’m trying to factor some tree removal cost into the house buying budget…. A 30-40 foot branch fell off of a maple tree in my neighbors backyard onto a boat in the water that was tied to my dock. About 3-4 foot of the branch landed on my proptery and the rest was in the accross the boat and into the water. The boat owners insurance contacted a contractor who called a tree company to remove the branch and the boat owners insurance paid them $500.00 for removal. The tree company charged over $3,000 and the contractor tacked on an extra $600 for himself. The tree company was there for about 9 hours total (18 man hours) and did not use any heavy equipment. The price seems pretty excessive to me, but I would like to get opinions about this?